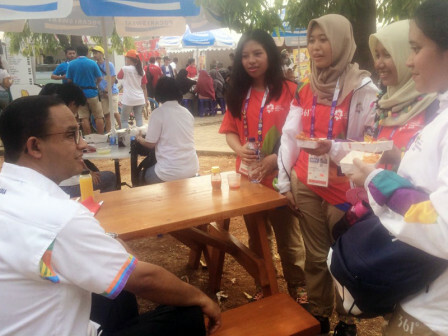 Volunteers' role and presence in Asian Games XVIII event can't be underestimated. They work from afternoon to night to succeed the biggest sport competitions in Asia.
" Again, I want to convey my thanks and appreciation to all volunteers"
Jakarta Governor, Anies Baswedan appreciates their hard work as volunteers. He said, Asian Games volunteers include in parties who work behind the scene. But they also become the front liners and play an important role for Asian Games succession. "Most volunteers are youths from different regions in Indonesia. They are not paid, but they can work wholeheartedly because of their love for Indonesia," he conveyed through his official Facebook account, Wednesday (8/29). According to him, it is an honor for them to be Asian games volunteers since they can take a part in our nation's history and get a precious experience. Thus Jakarta Government really supports and facilitates them such as by giving free Transjakarta bus ride. "Volunteer's enthusiasm makes every medals achieved by our athletes become more meaningful," he added. He reminds volunteers to maintain their health physically, morally, and intellectually until the end of Asian Games XVIII on September 2. "After Asian Games ended, volunteers will go home with pride because they have a chance to be a part of the devotion to country and nation. Again, I want to convey my thanks and appreciation to all volunteers," he expressed. Meanwhile, one of volunteers who work in Ticketing Division, Arum (24) from Tangerang mentioned, it is a pride to be a volunteer though she needs to go through selection process. But she can use this chance to add more work experience and get some friends from other regions. "Though I often go home late at night, but I will always be enthusiastic to be the part of Asian Games succession," she said at Gelora Bung Karno (GBK), Senayan, Central Jakarta. Similar thing also mentioned by Sari Devi (21) as volunteer from Venue and Environment Division who came from Surabaya, East Java. According to her who graduated from English Literature of Airlangga University, she gets a great experience to be Asian Games volunteer. "I became used to meet with many people. I happen to be graduated from English Literature, so this experience really help me to sharpen my skill in communicating. Moreover many foreign tourists and supporters in here," she said. She also appreciates Jakarta Provincial Government who have given free Transjakarta bus ride for volunteers. She considered this service to be very helpful in her access to work. "Every day I take Transjakarta bus for my transportation. It really helps me since it is free. Moreover, I came from outside Jakarta, so it is very helpful. Its access is easy and bus personnel are also informative," she expressed.